The militant group promotes this video as the first in a series of lecture-like 'programs' and the journalist is shown alone criticizing the West. BEIRUT – The Islamic State group on Thursday released a video showing a British journalist who says he is a prisoner of the extremists. In a slick, three-minute video shot with three cameras, John Cantlie, a photojournalist, said he worked for publications including The Sunday Times, The Sun and The Sunday Telegraph and came to Syria in November 2012 where he was subsequently captured by the Islamic State group. The group which now controls roughly a third of Syria and Iraq has beheaded two U.S. journalists and a British aid worker, and has threatened to kill another British hostage. The British government declined to comment on the video. Asked about the video, he told reporters that he had heard about it but has not yet seen it. “Obviously we’ll look very closely at any material that’s been released on the Internet,” he said, declining further comment. The just over three-minute long clip released Thursday by the Islamic State group’s media arm, Al-Furqan, was different than previous videos. Entitled “Lend me Your ears,” it is previewed as the first in a series of lecture-like “programs” in which Cantlie says he will reveal “the truth” about the Islamic State group. Wearing an orange T-shirt and sitting behind a desk, he criticized the war on the Islamic State group and said he and other British and U.S. hostages have been abandoned by their governments. 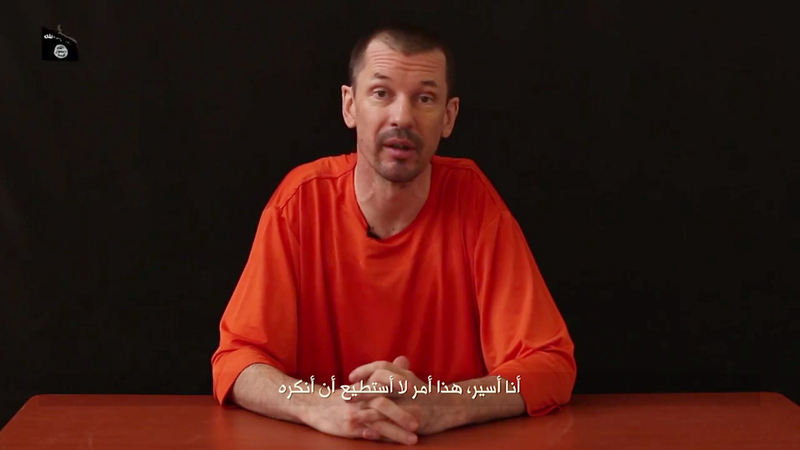 Cantlie’s name has not been mentioned among foreign hostages held by the group. He was briefly held up by Islamic extremists along with a Dutch photographer in Syria in July 2012. No Islamic State fighters appear in the video, which was posted online by users associated with the Islamic state group and reported by the SITE Intelligence Group, a U.S. terrorism watchdog. In addition to beheaded U.S. journalists James Foley and Steven Sotloff and British aid worker David Haines, the Islamic State group has threatened to kill Alan Henning, a British former taxi driver who was taken captive in December shortly after joining an aid convoy and crossing the border from Turkey into Syria. Associated Press writers Jan Olsen in Copenhagen and Sylvia Hui in London contributed to this report.